Last updated May 22, 2002. Birchbark canoes are perfectly suited to their purposes as transportation and hunting vehicles for the complex system of lakes and rivers in North America. All the materials used in their construction are found naturally in the vicinity of the builders as well as around the waters on which they are paddled. "Their origins lost in the mists of time, and the craft almost lost itself, a recent surge in the appreciation for wooden canoes has inspired a few builders to hone their skills, take on apprentices, and keep these boats on the water." While the hull of the canoe is made of bark (white side in), all the wooden components are made of local white cedar. All of these parts are held in place either by friction or by being bound with spruce or balsam root, and with basswood bark. Seams are sealed traditionally with a mixture of pine pitch and animal grease. Joe River Canoes, however, have their seams sealed with a rubberized compound that saves the owner the hassles of replacing or repairing the traditional (and troublesome) pitch. This sealer is the only non-natural element to our canoes. 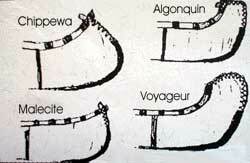 There are several components which affect the handling of a canoe. In the bark canoe’s construction, these can all be easily and inexpensively customized from one canoe to the next to suit the requirements of the owner. Length and Width will be defined by the number of people expected to paddle the canoe on a regular basis, and the type of paddling they will be doing. Greater girth is generally a good characteristic for canoes expected to carry a lot of gear. Fifteen to sixteen foot canoes are popular these days, but a lot of the original bark canoes were only twelve to fourteen feet long, making for easier portages and more responsive paddling. The waters paddled most often will affect the shape of the bottom of the canoe. The more rockered the canoe, the more easily it will turn, making it more suitable for rapids. The more rounded the bottom, the more stable the canoe will be in cross waves. On flat waters, a flat bottom is generally a good choice. 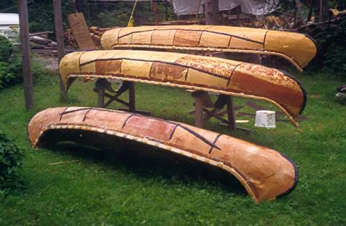 The style of the stems of birchbark canoes changed with the waters for which the canoe was intended, the preferences of the builder, but also the tribe or area from which the canoe came. The more popular styles of stems these days are the Chippewa (Ojibway) stems, the Voyageur stems used by the Hudson Bay and Northwest Companies, the malecite or passammaquoddy stems most closely reflected in synthetic canoes these days, and in the Algonquin stems. There are other styles of stems available that are less popular, and at Joe River Canoes, we are proud to offer you any and all of the styles ever made throughout the history of the craft.